Havana Heat is a neat little novel about baseball, history and politics, an imaginative take on what would have happened if Fidel Castro had really been a professional minor-league pitcher. There has always been speculation the Castro spent some time playing ball before he became a revolutionary, but such legends have pretty much been debunked. The reason I mention this title, apart from it's entertainment value, is that it presented me with a real stumper of a problem when I recorded it. 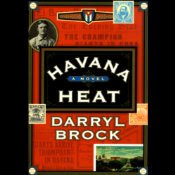 The main character is an American who travels to Cuba with a minor league team in the 1950's. He speaks Spanish, but it isn't always clear what language he's speaking when, and to whom. Sometimes the author refers to Cubans speaking English, but often the English-speakers and the Spanish-speakers simply chat away with no indication of what language they are speaking. The problem for the narrator, of course, is when to use accents and when not to. If the Cubans are speaking English, should they have accents? If they are speaking Spanish, then presumably they shouldn't, since they wouldn't have "accents" when speaking their own language. If two Cubans are speaking to each other but then speak in English to the American character, should they have no accents at first but accents when they speak to the American? But then, should the American sound like he's speaking Spanish? How do you do that? Occasionally the text gives some hints ("she said to him in Spanish" or "they spoke in broken English") but for the most part the story rattles along with everyone talking to everyone else, and after a few attempts to indicate who speaks English and who doesn't, the author sort of ignores the issue. That's not to say it's a bad book. On the contrary, it's a charming story and very nicely written. A print reader really wouldn't be aware of the issue. But clearly the author never considered what would happen if the book were to be read out loud. There's no easy way to establish any sort of convention for who speaks what how when. I can't remember exactly what my solution was, except to improvise as I went along. But I must have pulled it off because it got some nice reviews. Later this month I'll revisit this issue in light of an international thriller I've got coming up.